Setting foot on that first pirate ship was nothing compared to the life of freedom and adventure awaiting them, once Ivory and the girls were through playing nice. Only one man believes he can stop her and he won’t need a ship full of guns to do it. Award winning author, P.S. Bartlett, was born on Valentine’s Day many moons ago in South Baltimore, Maryland, less than a mile from Fort McHenry and Federal Hill. Her first novel, “Fireflies,” was published with GMTA Publishing in 2013 and the prequel to “Fireflies,” entitled “Hope From the Ocean,” was published in March of 2014. She loves history and historical fiction. She gets her history fix via movies, television and of course, books although she enjoys reading almost every genre. 1. What makes you feel inspired to write? Everything! Life is inspiring to me. The simplest things can be an inspiration. Images, emotions—emotions are a big one, other stories and the list goes on. 2. How did you come up with the idea for your current story? I like to write books with strong female characters. Of course no one is without flaws, feelings and struggle, so I like to put these women in challenging situations that way back when, women weren’t considered fit to be in. Haha to that! In “Fireflies,” for instance, Teagan Whelan wants no part of the traditional life. She wants to be a physician like her father. In “The Blue Diamond,” Ivory and her cousins are orphaned and forced to survive on their own the best way they can. Through that struggle, they find they can create a life for themselves that defies convention. They end up running for their lives and right into a whole new set of challenges as pirates. To get back to the original question, I had a dream I was a pirate on a ship. When I woke up, I imagined myself as one and who I’d want at my side, where we would go and what our lives would be like. I always draw on the personalities of people I know. Most of the characters in this book are no exception. The rest just kind of evolved from there. I hand write a loose outline. I choose my cast of characters and begin my research. When you write historical fiction, there is a great deal of research involved. I collected books, searched historical libraries and sites online and read other pirate stories to prepare. I needed to learn the parts of a ship, the ports of call in the Caribbean and the list goes on. Fortunately for me, I LOVE history and writing historical fiction is like taking a history class with every book I write. From there, I just take off and let the characters drag me along. I pull back when I think things are going off track or they are behaving in a manner that I do not think they would in a certain situation but for the most part, I weave in and out of my outline and stick to the main plot as much as I can. I definitely want to be a best seller. I still work a full time job. I need to write full time in order to reach the level of success I want. I’ve decided to hire an advertising and marketing company to assist me with reaching this goal so I entered a pitch contest with Pubslush and Booklogix. I won second place and my main prize was my own Pubslush campaign. The monies raised through my campaign are going to hire a book marketing company so that I can get my books in front of a much wider audience and find my readers. I know in my heart this is the only way I’ll ever reach my future. I’ll never get there being a full time office manager and part time writer. 5. Tell us three fun facts about yourself. I LOVE NFL Football. Watching it and rooting for my home team (Baltimore Ravens) is such a fun way to release a whole lot of stress and energy! I’m also an artist and I love to draw and paint portraits. Oh I have so many stories I want to write! I’m currently working on the third story in the Fireflies series. This one will be Teagan’s story of her journey to Philadelphia and medical school. I’m thinking of doing a novella on each child in the Whelan family but I’m not sure yet. If this book about Teagan ends up at 100K words, so be it. Then, I’m on to the next book in the Ivory Razor Adventure series. She has so much more to tell and so many more adventures to share; not to mention, her awesome cousins have lives of their own too! I believe I have more than enough material to write until I’m 100 years old! 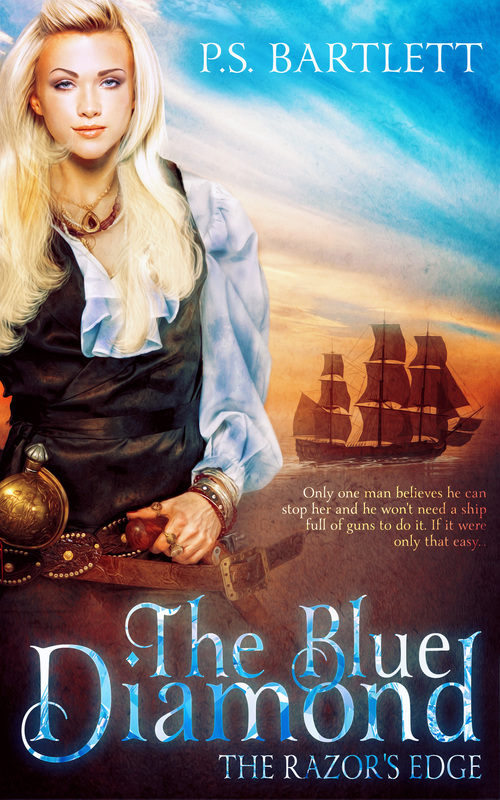 Thank you Elizabeth for have The Blue Diamond and me on your blog today! You are so welcome! Good luck with the book!